The new Jaguar XJ premium sedan has numerous premium infotainment features. Robert Bosch GmbH's multimedia unit provides an 8-inch high-definition touchscreen positioned within Draexlmaier Group's center console. Since the touchscreen is used to manage many of the vehicle's systems -- such as climate control, communication and navigation -- it reduces the number of regular switches required. The XJ's standard touchscreen has a dual-view option, allowing, for example, the driver to follow directions from the navigation system while the passenger watches television. British manufacturer Bowers & Wilkins supplies the XJ's 1,200-Watt 20-speaker surround sound audio system. Novelis Inc. supplies all the XJ's aluminum sheet metal, including the skin panels and the body-in-white structure, from its plants in Nachterstedt, Germany, and Sierre, Switzerland. Particularly noteworthy are the front fenders, made from a multi-layered aluminum material called Novelis Fusion. Using this alloy enables a reduction in fender thickness and weight and consequently reduces fuel consumption. The Canadian supplier, which is a wholly owned subsidiary of India's Hindalco Industries Ltd., further helps reduce the vehicle's carbon footprint by recycling waste aluminum from Jaguar's stamping plants. According to the supplier, 50 percent of the automobile's aluminum is recycled, equating to a CO2 saving of three tons per vehicle compared with conventional designs. Other important suppliers include Germany's Webasto AG, which delivers the car's standard panoramic glass roof. The glass has a dark-tinted reflective coating, preventing cabin overheating on sunny days. Valeo SA of France provides the Jaguar's xenon headlamps, which may be fitted with intelligent high beam assist and cornering functionality. 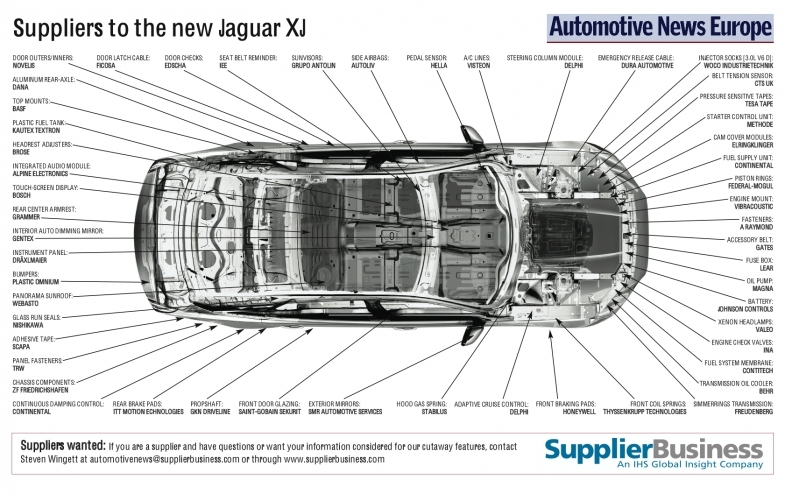 Jaguar assembles the XJ at its plant in Castle Bromwich, central England. Prices start at 53,900 pounds (about $79,790) in the car's home market.